Parameter Portlet : A portlet in which you select a number of parameters that may affect all your portlets on your page. These may include an effective date, the reporting period, the comparison type, the reporting manager, and the output currency for your reports. The parameter portlet is usually available at the top of the portal page. Pattern : A pattern comprises a sequence of time units that are repeated at a specified frequency. The Statutory Absence Payments (UK) feature uses SSP qualifying patterns to determine employees entitlement to Statutory Sick Pay (SSP). Pattern Time Units : A sequence of time units specifies a repeating pattern. Each time unit specifies a time period of hours, days or weeks. Pay Scale : A set of progression points that can be related to one or more rates of pay. Employee's are placed on a particular point on the scale according to their grade and, usually, work experience. Pay Value : An amount you enter for an element that becomes its run item without formula calculations. Payment Type : There are three standard payment types for paying employees: check, cash and direct deposit. You can define your own payment methods corresponding to these types. Payroll : A group of employees that Oracle Payroll processes together with the same processing frequency, for example, weekly, monthly or bimonthly. Within a Business Group, you can set up as many payrolls as you need. Payroll Reversal : A payroll reversal occurs when you reverse a payroll run for a single employee, in effect cancelling the run for this employee. Payroll Rollback : You can schedule a payroll rollback when you want to reverse an entire payroll run, cancelling out all information processed in that run. To preserve data integrity, you can roll back only one payroll at a time, starting with the one most recently run. Payroll Run : The process that performs all the payroll calculations. You can set payrolls to run at any interval you want. People List : An SSHR line manager utility used to locate an employee. Performance Management Framework (PMF) : A business intelligence tool used to alert users to exceptional circumstances, as defined by KPIs. When a particular factor measured by HRMSi goes beyond a threshold chosen by the user, the system sends the user a workflow notification. Performance Management Plan : The entity that defines the performance-management process for a specified period. A component of the Workforce Performance Management function. Performance Management Viewer (PMV) : A reporting tool that displays the report that corresponds to one or more PMF targets. Period of Incapacity for Work (PIW) : In the UK, this is a period of sickness that lasts four or more days in a row, and is the minimum amount of sickness for which Statutory Sick Pay can be paid. If a PIW is separated by less then the linking interval, a linked PIW is formed and the two PIWs are treated as one. Period of Placement : The period of time a contingent worker spends working for an enterprise. A contingent worker can have only one period of placement at a time; however, a contingent worker can have multiple assignments during a single period of placement. Period Type : A time division in a budgetary calendar, such as week, month, or quarter. Personal Public Service Number (PPS) : The Irish equivalent to National Insurance number in the UK, or the Social Security number in the US. Personal Tax Credits Return (TD1) : A Revenue Canada form which each employee must complete. Used by the employee to reduce his or her taxable income at source by claiming eligible credits and also provides payroll with such important information as current address, birth date, and SIN. These credits determine the amount to withhold from the employee's wages for federal/provincial taxes. Person Search : An SSHR function which enables a manager to search for a person. There are two types of search, Simple and Advanced. 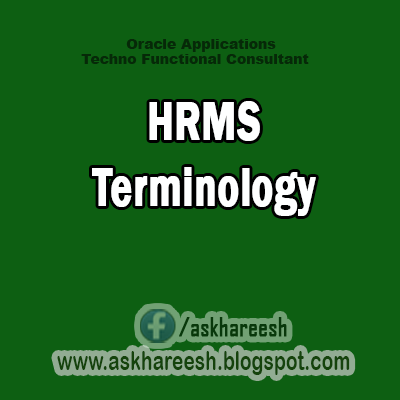 Person Type : There are eight system person types in Oracle HRMS. Seven of these are combinations of employees, ex-employees, applicants, and ex-applicants. The eighth category is 'External'. You can create your own user person types based on the eight system types. Personal Scorecard : A collection of objectives for a single worker arising from a single Performance Management Plan. Personnel Actions : Personnel actions is a public sector term describing business processes that define and document the status and conditions of employment. Examples include hiring, training, placement, discipline, promotion, transfer, compensation, or termination. Oracle HRMS uses the term self-service actions synonymously with this public sector term. Oracle Self Service Human Resources (SSHR) provides a configurable set of tools and web flows for initiating, updating, and approving self-service actions. Plan Design : The functional area that allows you to set up your benefits programs and plans. This process involves defining the rules which govern eligibility, available options, pricing, plan years, third party administrators, tax impacts, plan assets, distribution options, required reporting, and communications. Plan Sponsor : The legal entity or business responsible for funding and administering a benefits plan. Generally synonymous with employer. Placement Start Date : In DBI for HRMS Placement Date is the contingent worker's most recent start date prior to the effective date. Position : A specific role within the Business Group derived from an organization and a job. For example, you may have a position of Shipping Clerk associated with the organization Shipping and the job Clerk. Predefined Components : Some elements and balances, all primary element classifications and some secondary classifications are defined by Oracle Payroll to meet legislative requirements, and are supplied to users with the product. You cannot delete these predefined components. Professional Information : An SSHR function which allows an employee to maintain their own professional details or a line manager to maintain their direct reports professional details. Proficiency : A worker's perceived level of expertise in a competency, in the opinion of an assessor, over a given period. For example, a worker may demonstrate the communication competency at Novice or Expert level. Progression Point : A pay scale is calibrated in progression points, which form a sequence for the progression of employees up the pay scale. Prospect Pool : (iRecruitment) The prospect pool contains all registered users who have given permission for their information to be published. Provincial/Territorial Employment Standards Acts : In Canada, these are laws covering minimum wages, hours of work, overtime, child labour, maternity, vacation, public/general holidays, parental and adoption leave, etc., for employees regulated by provincial/territorial legislation. Provincial Health Number : In Canada, this is the account number of the provincially administered health care plan that the employer would use to make remittances. There would be a unique number for each of the provincially controlled plans i.e. EHT, Quebec HSF, etc. PTO Accrual Plan : A benefit in which employees enroll to entitle them to accrue and take paid time off (PTO). The purpose of absences allowed under the plan, who can enroll, how much time accrues, when the time must be used, and other rules are defined for the plan.